The Stockton Ports held their fifth annual breast cancer awareness night on August 26 at Banner Island Ballpark. All proceeds from the night benefited St. Joseph’s Medical Center, Breast Health Services. On this night, the Ports raised close to $5,000, bringing the total monies raised in five seasons to just over $25,000. 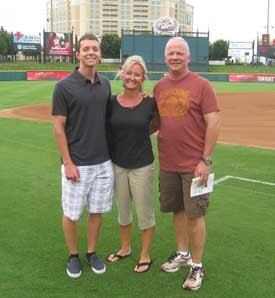 In 2010, Pink Night hit close to home with the Stockton Ports family when Becki Scarsone, wife of then manager Steve Scarsone, was battling through the disease. Today Becki is doing great and is cancer free. Prior to the game against the Inland Empire 66’ers, the Ports hosted the second annual “Bombs 4 Bombs Home-Run-a-thon” presented by Turner Construction. 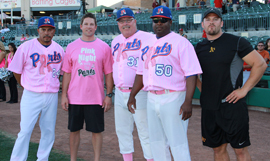 The Ports recruited 24 participants who were eager to hit home runs to help fight breast cancer. Each softball that crossed the pink line in the outfield was counted as a home run. Fans were encouraged to make pledges to support the event. This year 73 home runs were hit, compared to the 48 hit in 2010. With the home run event alone, close to $500 was raised. The roster for the event included Ports manager Webster Garrison, hitting coach Brian McArn, pitching coach Craig Lefferts, athletic trainer Nate Brooks, strength coach Chris Borgard, clubhouse manager Vic Zapien, Thunder Hockey front office staff, Ports front office staff, Port City Pirates Basketball head coach Wallace Bryant, Mega 100 representative Christie James, Sacramento Kings announcer Scott Moak, Eddie Maria from the Stockton Fire Auxiliary, California Cougars Soccer player Chris Handsor, DJ Walker from KAT Country, Norma DePauli from St. Joseph’s Medical Center, former San Francisco Giant Patrick Dobson, and the coaching staff from Inland Empire. Not only did $1 from every ticket sold that night go to St. Josephs, but the Ports had a number of events going on through out the ballpark to help raise as much money as possible. Fans had the opportunity to bid on the specialty pink pinstriped jerseys being worn by the players, there was a 50/50 raffle, a player memorabilia raffle, specialty pink T-shirt sales, pink baseball sales for the Pink Wall, and KAT Country even raffled off tickets to an upcoming Taylor Swift concert. The popular ‘How Ya Bean’ kiosk also contributed by donating $1 for every pink Volcano drink sold that evening. Before the game between the Ports and the 66’ers even began, nine courageous breast cancer survivors took the field with our players for the national anthem as Pink Ports. Each woman got to stand with a favorite player through the duration of the opening ceremony. A group of courageous cancer survivors joined the Ports player on the field as Pink Ports during the national anthem. From left to right, Ports hitting coach Brian McArn, athletic trainer Nate Brooks, pitching coach Craig Lefferts, manager Webster Garrison, and strength coach Chris Borgard all participated in the pre-game “Bombs 4 Bombs Home-Run-a-thon” presented by Turner Construction. 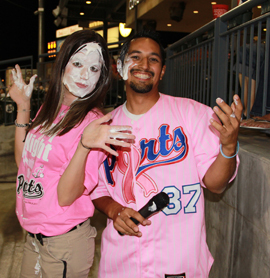 Community Relations Manager Margaret Sacchet lost a bet with on-field MC Hot Rod & was pied in the face for charity in front of the Pink Night crowd. 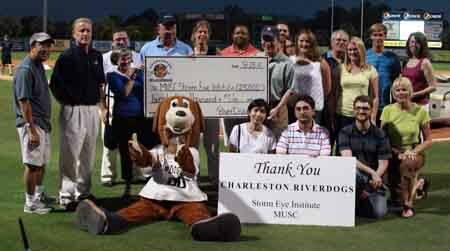 The Charleston RiverDogs have yet again left a large paw print on the fight against blindness and the disease retinitis pigmentosa. Between games of Tuesday night’s doubleheader against the Greenville Drive, RiverDogs General Manager Dave Echols presented a check for $25,000 to Dr. Ed Wilson, M.D. and representatives from the MUSC Storm Eye Institute. The donation comes primarily from the RiverDogs’ 12th annual Kindness Beats Blindness auction that was held on June 25. With turnouts in the thousands in each of the 12 years of the auction, the team and community as a whole have raised more than $450,000 towards preventative research for the degenerative eye disease. The auction hits close to the RiverDogs’ family since Rebecca, the daughter of club president Mike Veeck was diagnosed with retinitis pigmentosa, a group of inherited diseases causing retinal degeneration. Veeck and his wife, Libby, have dedicated themselves and most of their charitable efforts toward fighting blindness. For more information on the MUSC Storm Eye Institute and their effort to battle RP and other degenerative retinal diseases, visit www.muschealth.com/eyes. Fort Wayne, IN – This Saturday, Sunday, and Monday fans are asked to bring non-perishable food items to Parkview Field with them to help feed their hungry neighbors. On Saturday, August 27th at 7:05pm Comfort Keepers is sponsoring “Slugging for Seniors” a senior hunger food drive to collect non-perishable food items specifically for Community Harvest Food Bank of Northeast Indiana to use for their SeniorPak program. SeniorPak is a program that delivers groceries every two weeks for over 1,200 needy, homebound Seniors. Post-Game Fireworks and an appearance by Birdzerk! will also be featured that evening at the park along with a silent auction for two autographed TinCaps jerseys! All proceeds benefit Community Harvest Food Bank. Then, on Sunday, August 28th at 3:05pm and Monday, August 29th at 7:05pm, a food drive will be held by the Society of Saint Andrew, a non-profit ecumenical Christian ministry dedicated to fighting hunger in our nation and the world. The Society works primarily to salvage fresh produce that would otherwise go to waste and deliver it to people in need. On August 5th the Society of St. Andrew delivered a semi-load of sweet potatoes to Community Harvest and they will start the Saturday and Sunday TinCaps food drive off with 120 cans of vegetables. Fans are asked to bring cans of food and place them in barrels located around the ballpark. Suggested items are: canned meats, canned fruits and vegetables, peanut butter, pasta or noodles, canned soups and stews, toilet and facial tissue, and personal hygiene products. 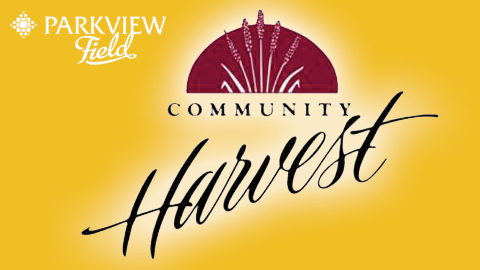 Community Harvest Food Bank of Northeast Indiana, Inc. is a not-for-profit organization dedicated to the alleviation of hunger through the full use of donated food and other resources. As the largest food bank in northeast Indiana, it collects and distributes over 10 million pounds of donated, surplus food annually through a network of human service member agencies. Community Harvest Food Bank serves Adams, Allen, DeKalb, Huntington, LaGrange, Noble, Steuben, Wells and Whitley counties. Visit www.chfb.org, find them on Facebook, and follow them on Twitter. Undernourishment and malnutrition are serious problems for America’s growing 65+ population. In fact, as many as one out of every three seniors are at risk for under- or mal-nutrition. To raise awareness for this growing problem, Comfort Keepers in Fort Wayne is participating in a nationwide STOP Senior Hunger Food Drive from August 15th through November 1st; all proceeds from the local food drive will benefit the Community Harvest Food Bank of Northeast Indiana. Comfort Keepers in Fort Wayne opened for business in September 2001 and will be celebrating their 10th year in business this year. They have established an excellent reputation for the quality of care their caregivers provide. Our caregivers provide non-medical in home care for seniors and others requiring assistance in their homes. Comfort Keepers expanded their reach in 2007 with the purchase of their second franchise in the Fort Wayne area and currently cover the counties of Allen, Adams, DeKalb, Huntington, Noble, Wells and Whitley. For more information visit their website at www.comfortkeepers.com/fortwayne-in. The Society of St. Andrew, formed in 1979 with Headquarters in Big Island, VA., is a non-profit ecumenical Christian ministry dedicated to fighting hunger in our nation and the world. The Society works primarily to salvage fresh produce that would otherwise go to waste and deliver it to people in need. Visit www.endhunger.org for more information or e-mail hranin@endhunger.org for Indiana info. This article originally appeared on the official website of the Fort Wayne TinCaps. Click here to view the original story. 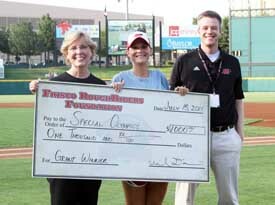 The Frisco RoughRiders Foundation awarded 5 grants to The Special Olympics, West Dallas Community School, Plano Children’s Medical Clinic, Buckner International and the Sci-Tech Discovery Center in Frisco during the 2011 season. Each organization received a $1,000 grant from the RoughRiders Foundation to help continue its mission serving the North Dallas Community. 2011 marks the fourth year of the RoughRiders Foundation’s Grant Program and each of the five grant recipient organizations plan to use their grant in different ways. Each organization that received a grant also received 4 tickets to a RoughRiders game and participated in an on-field check presentation. Non-Profit Organizations interested in applying for a grant in 2012 can visit www.ridersbseball.com/foundation or contact Michael Davidow at mdavidow@ridersbaseball.com. (Left to Right) Special Olympics Texas Development Director and Program Director, Alice Brimelow and Cyndi Murchison, and RoughRiders Foundation Director, Mike Davidow. Buckner International President, Dr. Albert Reyes and his wife tour Dr Pepper Ballpark before their check presentation. The RoughRiders Foundation awarded $10,000 in scholarship money to five graduating high school seniors in North Texas during the 2011 season. The 2011 scholarship recipients are Rooks Patterson and Blake Harrell from Frisco, Mauro Santos and Arturo Gonzalez from Dallas, and Kenbea Walker from McKinney. Each scholarship winner received $2,000 for their college education, tickets to a RoughRiders game, all-you-can-eat food and Dr Pepper products and a VIP tour before the game. Since the RoughRiders Foundation started their scholarship program seven seasons ago, they have awarded over $55,000 in scholarship monies to local students. Over 270 applications were submitted by high school seniors around the Dallas and Fort Worth Metroplex. All applicants must have met the criteria of a minimum 3.0 GPA and participated in at least one athletic activity during their senior year. Winners were selected by the RoughRiders Foundation Board of Directors based on academic merit, financial need and athletic accomplishments. 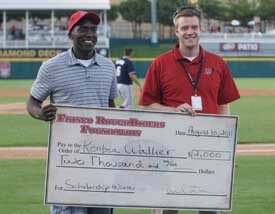 Scholarship Winner, Kenbea Walker (left), and RoughRiders Foundation Director, Mike Davidow. Scholarship Winner, Blake Harrell, and his family. The Hagerstown Suns are pleased to announce that more than $6,000 was raised on Nick Adenhart Night at Municipal Stadium Tuesday. These proceeds from the silent auction and a portion of ticket sales will be donated to the Nick Adenhart Memorial Fund. Adenhart grew up in the Hagerstown community and was a well-known athlete throughout the region before he reached the national stage with the Angels. In 2009, he was killed in an automobile accident. After his passing, a community foundation that provides funds for youth baseball organizations was established in his memory. The Nick Adenhart Memorial Fund provides financial support to nonprofit youth baseball organizations that support the growth of the individual, the value of teamwork and the advancement of the game in their community. This article originally appeared on the official website of the Hagerstown Suns. Click here to see the original story. 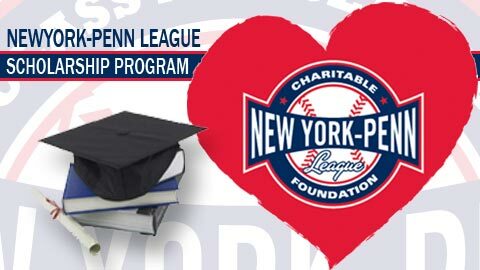 The Class-A Short-Season New York-Penn League, its member clubs and the league’s philanthropic arm, the NYPL Charitable Foundation, once again awarded over $10,000 in scholarships to deserving high school graduates from the league’s 14 markets. The 2011 NYPL Scholarship Program was open to any graduating senior from a public or private high school within the league’s footprint, who has been accepted at any two or four-year college or university, vocational or technical education institution. Applicants were judged based on academic performance, volunteer and extracurricular activities, and the impact their local NYPL club and Minor League Baseball has had on their lives. The Scholarship Program consisted of two stages – a local round and a divisional round. In the local stage, students applied directly with their local NYPL team, with one applicant chosen by each of the 14 teams to advance to the divisional round. The 14 finalists were separated by the division of the team they represent. The winning application from each of the NYPL’s three divisions (McNamara, Pinckney and Stedler) received the top prize of a $2,500 scholarship. All other finalists received a $250 book award. Andrea Moore, of Staten Island, took home the $2,500 scholarship from the McNamara Division. Andrea’s academic accomplishments, leadership experience, exceptional community service efforts and extra-curricular activities made her stand out above the rest. The Staten Island Yankees wish to congratulate Andrea and applaud her charitable contributions. 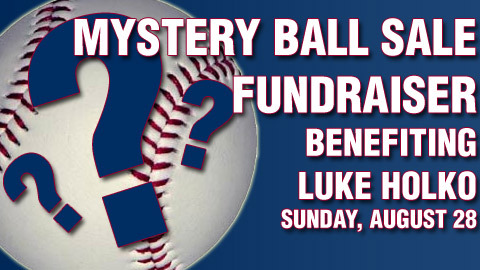 Niles, Ohio – The Scrappers are hosting a Mystery Ball Sale Fundraiser for Luke Holko on Sunday, August 28. The sale begins once the gates open and is first come first served. Additionally, the Scrappers are donating half of the proceeds from ticket purchased with this flyer to the Luke Holko Fund. Sunday, August 28 is also Wrestling Night featuring a post-game wrestling event featuring the Necro Butcher, Al Snow, “The Mouth of the South” Jimmy Hart, and Mick Foley. For more information, call the Scrappers front office at (330) 505-0000 or email info@mvscrappers.com. 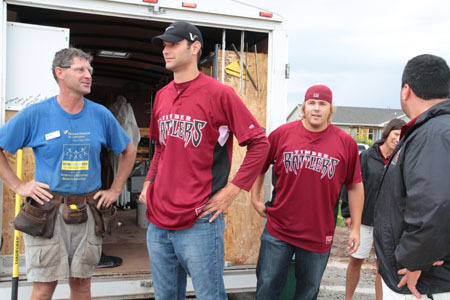 On Tuesday, August 2nd, two Timber Rattlers pitchers and a few members of the team’s front office visited one of Fox Cities Habitat for Humanity’s work sites. Pitchers Stosh Wawrzasek and Matt Miller volunteered their time before taking on the Clinton LumberKings to thank the volunteers for their hard work and dedication to our community. This marks the second year that the team provided lunch to one of Habitat for Humanity’s work sites. It’s a great opportunity to get the team more involved in the community. Likewise, the volunteers love being able to chat with the players about their minor league baseball experience…and even get a few autographs! The Greater Fox Cities Area Habitat for Humanity has built over 130 houses and counting in the Fox Cities, providing a new home for nearly 500 people in the community. In partnership with hundreds of dedicated volunteers and supporters, Greater Fox Cities Area Habitat for Humanity is building hope, one house at a time. The Wisconsin Timber Rattlers look forward to supporting Fox Cities Habitat for Humanity for many more seasons to come! 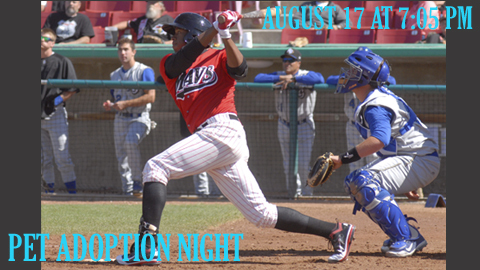 Join us on Wednesday, August 17th for Pet Adoption Night as the Mavericks take on Inland Empire at 7:05 pm. We will have four local animal rescues and shelters at the stadium: Pets Forever Found, California Bully Crew, Apple Valley Animal Shelter, and German Shepherd Rescue of High Desert. These groups will have dogs and cats at the stadium available for adoption, which you can take home after the game. Visit their tables on the concourse during the game to find out how you can adopt a pet or volunteer. Unfortunately, fans will not be allowed to bring their pets inside the stadium for the game. It’s also Kids Eat Free for kids 12 and under. Kids will receive a free hot dog and soda from the concession stand. Come out to the ball park for this one of a kind night! Buy your tickets today at the box office, online or call us at (760)246-6287. This article originally appeared on the official website of the High Desert Mavericks. Click here to view the original story. The Dayton Dragons, in conjunction with Community Blood Center, are working to raise awareness about the importance of blood donation in the Miami Valley. 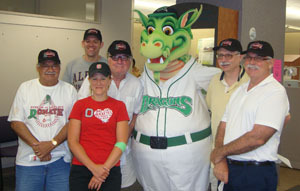 Community Blood Center has “Gone Dragons green” during the 2011 baseball season by working with the Dragons to reward and attract more local donors. With the help of the Dragons, Community Blood Center has been able to reach out to the Miami Valley in a new way. The summer donation season has featured limited edition Dragons/Community Blood Center t-shirts, mascot visits to Community Blood Center events, and other unique Dragons related rewards for the volunteer donors that have participated this season. 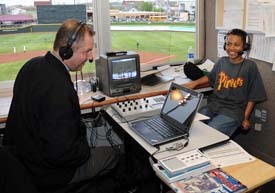 On July 25, 2011, the Community Blood Center was also featured on the plaza at Fifth Third Field before the Dragons game. They wanted to help raise awareness about donating blood to all Dragons fans in attendance. 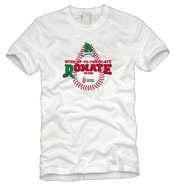 This limited edition Dragons T-shirt helped Community Blood Center reward current donors and attract lots of new ones. Heater, the Dragons mascot, made visits to Community Blood Center throughout the summer months to thank donors and encourage new visitors to check out the facility. Join us on Saturday, August 13th for our Cancer Awareness Fireworks Night presented by Supercuts. Watch the High Desert Mavericks take on the Stockton Ports at 7:05 pm with a spectacular fireworks show following the game! Throughout the night, Supercuts hair stylists will be giving away free haircuts and donating hair to Locks of Love. We’ll also welcome a host of organizations which are helping lead the fight against cancer, including the Mary Kay Foundation, Ed Randall’s Bat for the Cure, and Susan G. Komen Inland Empire Affiliate. Visit these tables to find out how you can be involved and support cancer awareness. 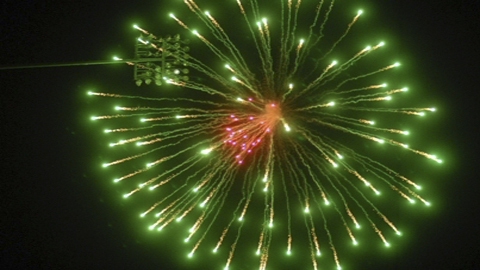 Stay after the game for the High Desert’s best fireworks show! Buy your tickets today online, at the box office or call us at (760)246-6287. The Dragons MVP Program, a tool for teachers has made the popularity of the Dayton Dragons an educational tool for fourth and fifth grade teachers, helping them motivate and reward students for success in the classroom. This program, which is in 900 Dayton-area classrooms, reaches more than 25,000 students. Each classroom teacher is given five “Dragons MVP” awards to hand out at their discretion. The awards include tickets to a sold-out Dragons game, a custom “Dragons MVP” hat, a certificate recognizing their achievement as a “Dragons MVP” and also admission to a private field day/carnival with the entire Dragons team. These “Dragons MVP” awards, which were distributed to the teachers at absolutely no cost, were awarded to students as the teachers saw fit. In addition to handing them out for success and achievements inside the classroom, many teachers rewarded students for accomplishments in the community as well. The Dragons also shared some of the stories of success and achievement the “Dragons MVP” students created in local newspaper ads, television and radio commercials, and also in full page ads in the Dragons game day program. Plus, 24 winners were selected to either throw out a first pitch or participate in an on-field entertainment skit on the night they attended the sold out Dragons game. The Dragons also made Player/Mascot visits to 12 schools that participated in the MVP Program. 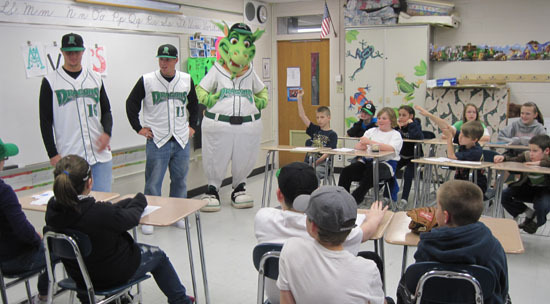 Two Dayton Dragons players and the mascot, Heater, went to these schools and provided an entire class with an opportunity to ask questions of the players, get autographs from the players and hugs from our mascot. Every child in these classrooms received a Dragons hat, a Dragons baseball and a Dragons pen during the visit too. Dragons players and mascots visit a local classroom as a part of the "Dragons MVP" program that rewards outstanding 4th and 5th grade students. 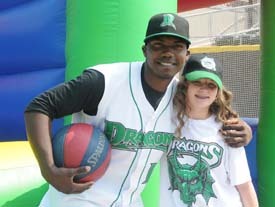 An MVP poses with her favorite Dragons player at a private field day only for Dragons MVP winners.